Let’s be real. You know, like totally real here. No, I’m not going to reveal an inner secret, I do that enough indirectly by these podcasts already. No, I mean let’s discuss the physical world. We’ve all heard about inertia and momentum, but few people know the difference. Sure, metaphorically people say “I’m building momentum” but even fewer ever say anything about their inertia. Inertia is derived from the Latin word “iners”, which means idle or lazy. Interesting, eh? Inertia is a measurement of how lazy the system is. Literally. It’s literally described as being a measurement of “how lazy a system is.” See where I’m going yet? An object at rest stays at rest and an object in motion stays in motion with the same speed and in the same direction unless acted upon by an unbalanced force. Meaning, if something is just sitting there, that’s what it’s going to do. If something is moving, that’s what it’s going to keep doing, unless something messes with it. A big rock is just going to sit there. A paper bag is not, even though they are both sitting there. Why does the bag move? Because it is affected by the external forces easier than the big rock. They are both being pulled upon by gravity, both being randomly pelted by rain, sleet or what we like to call precipitation in Wisconsin, a “wintry mix.” And they both are being accosted by wind. Aha. Because of the lightness of the bag it is less anchored. Because of the surface of the bag, it is subjected to catching the wind. If you take a picture of a big rock, you can’t tell if its a still day, or the middle of a hurricane unless there’s visible precipitation. However, on a still day the bag lays there, on a windy day its zooming around and now its not in the picture anymore. A baseball thrown in space at 80 miles an hour is going to keep going through space for a very very long time, at 80 miles an hour. Nothing is messing with it – not air resistance, not gravity, nothing. Sure there are particles it’s going to hit, and microgravity from everything in the universe – a nearby star or planet or moon, but noticeably it just keeps going. Throw that same baseball on Earth and it doesn’t go very far – gravity yanks it down, and air resistance slows it the whole way. A few seconds later it’s just sitting there in the grass. So in both instances – the unmoving rock and bag, and the moving baseball – are examples of inertia. So now we are on the same real page, yo. Some people mistakenly call that momentum; it’s not. It’ inertia, and it’s a perfectly applicable description of how we move through life – metaphorically. Let’s talk about your inertia. Or rather, inertias, because you have a lot of different moving and unmoving things in your life. Everything in your life has inertia. There are things that have no motion, they just sit there, anchored to your life the way the rock is anchored to the earth. There are things that are in motion, like the baseball that keeps moving depending on how many external elements start messing with it. Your job – you get up for work every day at about the same time and do what you need to do to be there. If it’s a job then you probably predictably go home at the same time. If it’s a career then you predictably do NOT go home at the same time, and so forth. It’s in motion. The same for your relationship – it is in motion, you see your significant other at a certain rhythm or rate. You give it a certain amount of time in your life – a certain amount of effort, and you fit it in with the other things. There are things in your life that are at rest – they don’t move, they don’t do nothin’. You may say that if they don’t move at all they aren’t even in your life. But they are. There are things in your life that used to move, but no longer do. Things like a workout class you no longer attend because you have kids now. Or a fun hobby you no longer do because you don’t have the time, or the energy to do it any more. Or you used to date, but now you figure it’s just too much effort and being alone is easier. 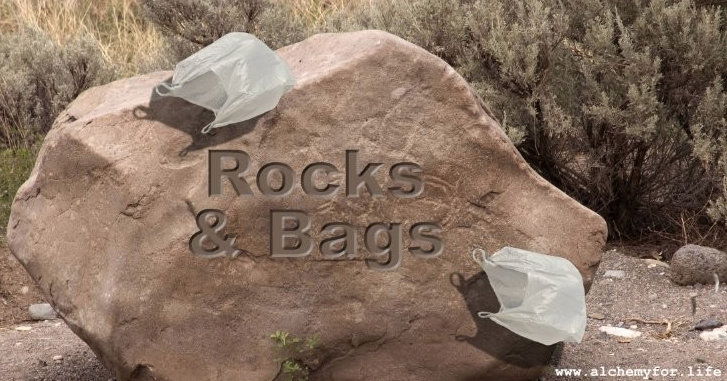 They all sit there, some are like rocks, and some are closer to bags. Most are probably rocks if you’ve already forgotten about them. It will take a lot of time and energy to get that hobby going again, until the it’s just sitting in the ground. There are a lot of things in your life in motion, and at rest – in fact more than you are aware of. It’s this lack of awareness that keeps them in their current state. In some cases it’s convenient, in other cases it’s not only not convenient but kind of harmful. Creating an awareness, or heightening your awareness of these things can only help. Spend a few minutes thinking about what is at rest in your life. Think about all the rocks first. What things are just sitting there and there’s NO way they are gonna move, except for the metaphorical hurricane or worse. Think about the things you used to do, the things you used to be a part of. Good and bad. Then think about all the paper bags. Think about those same kind of things, but not the ones that are so rooted. What about the ones that you could start up again, or rather might just start up on their own due to external forces. Good and bad.